​Based in Axminster, East Devon, we are right on the Devon, Dorset & Somerset borders with the popular holiday resorts, Lyme Regis & the Jurassic Coast, just a stones throw away. We are a family run business specialising in clothing and equipment for the sailor and watersports enthusiast. We pride ourselves on exceptional customer service and have a no quibble returns policy, so in the unlikely event that should something go wrong with your order, or you're just not happy with the product, you can be sure that if there is a problem it will be dealt with promptly and professionally. Spending most of our free time on the water you can be sure that if you contact us you will receive expert and knowledgeable advice. We are a local sailing, kayak, surf and kitesurf shop serving not only our customers online worldwide but more locally, Lyme Regis, Seaton, Charmouth, Bridport, Weymouth, Honiton, Taunton, Yeovil, Exeter and Sidmouth. Dave (Owner) was brought up in Tenby so spent a lot of time in boats, surf and on the beach. 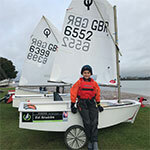 He is a keen sailor and started his sailing career in Mirror Dinghies at the age of 11 with his brother Steve, they won the Welsh Schools Nationals at the age of 14 and then moved on to 420s and training with the Welsh Youth Squad and then the UK Youth Squad. When too old for Youth Squad Dave sold the 420 and bought an International 14. After 12 years racing and several boats later he had a break for a few years to start a family. He now sails at Lyme Regis Sailing Club in a RS100, a RS400 and a RS200. If you call up you will more than likely speak to Dave. 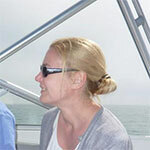 Suzanne (Co-Owner) is fluent in French . She also spends a lot of her time on the water but prefers to stay dry. Having started her sailing career as a trolley dolly she knows her way around a boat and the dinghy park, but prefers nowadays relaxing on yachts and paddleboarding in the sun. Little Man (The youngest member of the Team) is a keen Oppie and RS200 sailor. He helps out in the shop when he's not in school, but you won't catch him answering phones.